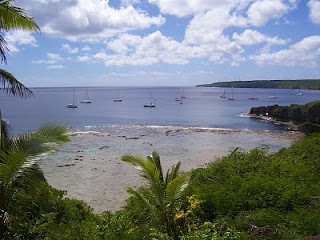 As with anyplace, Niue has its strengths and weaknesses. Niue is independent, but protected by New Zealand and the Niueans enjoy dual citizenship. There is one flight a week to New Zealand and many of the Niueans took it and never came back. Currently most Niueans live in New Zealand and the islands population is 1/3 what it was in 2004, so there are a lot of empty houses and things are almost too quiet here. The island is a coral atoll that has been uplifted to a maximum height of about 60 meters. Most of the island has a very steep rugged coastline, then flat all the way across the top. It's really strange to see a coral head sticking up in the middle of a forest! Access to the water is very limited, and there are almost no beaches on the island. It has a roadstead anchorage at the main town on the west side that it fine as long as we have easterly trade winds, but low pressure systems passing to the South can cause the wind to reverse and the anchorage becomes untenable. It is looking like that will happen to us on Monday or Tuesday, so we will soon be on our way. The island was pounded by a hurricane from the west in 2005 which caused a lot of wind and wave damage to the town (which is at the top of the bluff) and probably contributed to some of the population loss. I had hoped to do some diving here, but there is only one dive company with a tiny boat and they are booked up, so we're having to take a pass. It's too bad. The water is very clear here, though cooler than our prior stops. When we were in Mexico, we ran into a number of cruisers who had set off to go around the Pacific or all the way around the world, but never got out of Mexico. From what I've seen on this trip, I think that was a huge mistake for them. Every island seems to offer something new and different.